Quiz is a fashion retail group that has a focus on cat-walk style looks and the latest trends at affordable, high street prices. You can save even more money when shopping with the group when you use a Quiz Clothing discount code. The company’s main target market is the modern woman who wishes to achieve the perfect look, whether it is at a party, day to day, or at work. They aim to be exciting and innovative, offering bright colours and vibrant patterns in a range of designs and fabrics. The in house buying and designing team are responsible for sourcing the latest styles from the catwalk to the shop floor. Purchase jackets, jeans and much more at Quiz Clothing. Get them to your doorstep for free when you spend over £60. Get a stylish look by wearing these tops, skirts and much more which are available from this online store at a huge discounted price. 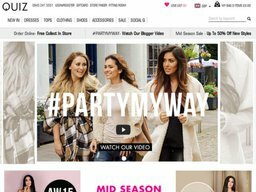 Quiz offer their customers the choice of shopping online through their ecommerce website, or in one of their 250 stores either in one of their standalone stores or concession shops in Debenhams department store, at all of which Quiz clothing voucher codes can be used. The company was formed in 1993 with the humble beginnings of 3 stores throughout Scotland. 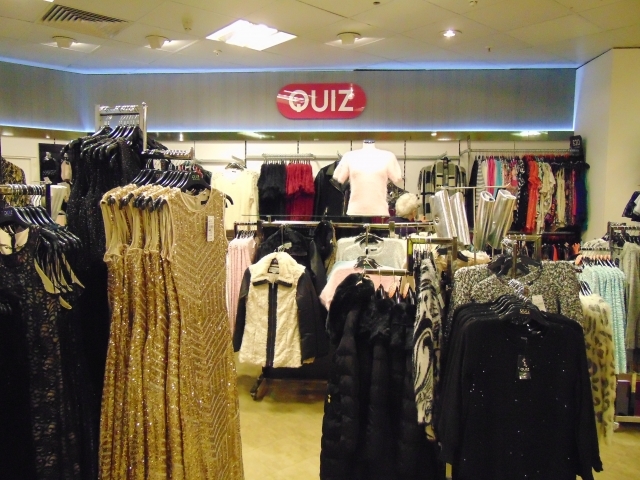 The business model of these three stores proved to be very successful, therefore more stores continued to open the following years, and Quiz Clothing grew beyond Scotland with stores in most major shopping centres and high streets across the UK, employing over 1000 members of staff. With the online store opening 12 years after its founding in 2005. There are also over 50 franchises in Asia, and Europe, with the company gradually becoming a well-known international business. Make use of a Quiz Clothing promo code and get more for your money when you buy dresses, tops, trousers, skirts, shoes, accessories and more. Rather than shopping by category, customers can shop via collection, such as Festival fever, Party please and Oh-Casion. Quiz Clothing online has a whole page dedicated to sale items, where you can view the entire sale, by category, or take a look at the products that have either £5 or £10 off the original selling price. Some of the sale items are web exclusives, meaning that you can only get them for the reduced price online, while other items you will be able to find both online and in store. The sliding scale at the side of the page make it easier to filter the items by price, so you never pay more than you want to for your sale items. When you sign up to the company newsletter, you will get updates, new products, Quiz Clothing discount code, competitions and more sent straight to your inbox. Plus, when you sign up to the newsletter via the website, you will get 10% off your next order, helping you to save even more money. Students can get money off of their order just by being a student through UNiDAYS. All you have to do to benefit from a 15% off Quiz Clothing promotional code, is to register online with UNiDAYS to verify your student status. Quiz Clothing is connected the world in a variety of different ways. From a YouTube channel, a Facebook, Instagram, Pinterest, Twitter, Google+ and even snapchat account. Following the company on one of these social media platforms is a good way to stay connected about new updates in the company, with new posts, photos, competitions and Quiz Clothing discount vouchers being posted regularly. By downloading the Quiz Clothing app, you can shop on the go while you are out and about, so you never have to miss out on the latest outfit or the best deal. Browse through the many categories, add items to your basket and then pay at the checkout through a mobile or handheld device. You can also use a Quiz Clothing promotional code to get money off of your order. Quiz offers a range of different delivery options depending on how quickly you need your products to arrive. Delivery is free if you collect it in one of the quiz stores, or also if you spend over £60 on the website. Standard delivery takes 2-5 days to be delivered to your doorstep after you place the order, and costs £3.95. For nominated day delivery or Saturday delivery, it will cost £5.50. Alternatively, if you need international delivery it will take 3 to 10 days to arrive, and is free if you spend over £25. In order to return an item, you need to log into your account online and select the items that you wish to return from your purchase history. Once the return has been authorised, you can send your items back by post. Alternatively, if you have bought your items in store, they can be retuned in store also. Remember to use Quiz Clothing discount code and save money while shopping.